Ears are integral part of our sensory system and any issues with them can greatly affect our efficiency and productivity. 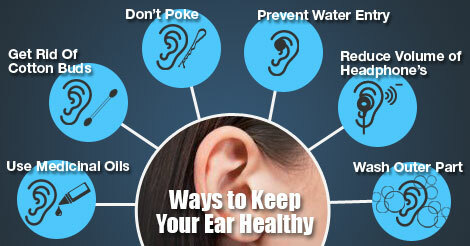 Ear health is often ignored, while it is very easy to maintain proper ear health with simple tips. Inner ear is a very sensitive and delicate organ. Do not poke your ear with any sharp object like pencils, scissors, or clips. Any damage to internal ear can lead to permanent hearing loss. Ear hygiene is very important for its health. Wash the outer part of ear with water while bathing. Cleaning back side of ear with little soap is also very important as lots of dirt get accumulated there. Cotton buds for ear health are biggest myth. Rather, using cotton buds can irritate the skin inside the ear and can lead to infection. Also, cleaning ear with cotton buds can push the ear wax more inside the ear and thus make it more difficult to remove. It is important to prevent water entry inside ear while bathing or swimming. Tap water and pool water may contain bacteria which can go inside your ear and cause infection. It is advisable to wear ear plugs while swimming. Rather than using any moisturizer or oil, it is always preferable to use sterilized medicinal ear oil. Medicinal ear oil helps to lubricate the flaky skin inside the ear and promotes natural dispersion of ear wax. The bony apparatus inside ear which helps us to hear is very delicate. Loud noises, especially from head phones, can damage this gentle apparatus and can lead to permanent hearing loss. Thus avoid exposure of high decibel sounds on ears. Always contact your physician for minutest ear problem like pain, swelling, or hearing problem. It is important to treat ear related problem as soon as possible as ears also maintains the equilibrium of the body and allows us to stand and walk correctly.